Looking up Pot Shaft. The slight twist in the shaft can clearly be seen. The twist is thought to be due to the miners building staging every ten feet or so with ladders between. The shaft is much larger than those excavated in the 17th and 18th centuries. At the top is the metal lid installed by the DCC before we realised that this was a Roman Shaft. 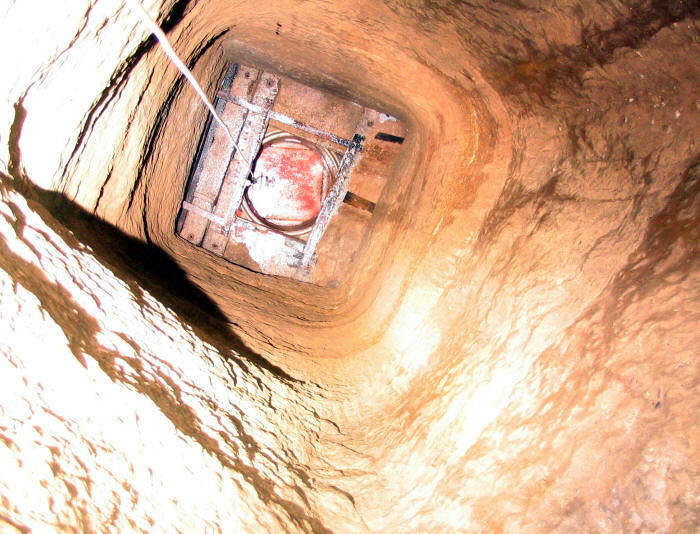 The shaft was dug out under archaeological supervision and with a full record being made. (Right) Roman planks. 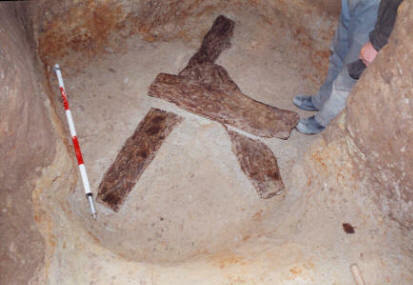 Three pieces of timber were found in the bottom of Pot Shaft when the excavation was almost complete. They have been carbon-dated to BC but may of course have been old timber re-used. Hopefully, at some time in the future, further work will be possible to establish a more accurate date and to find out why they have not decayed. (Left) The Roman level. Looking along the passage that connects Pot Shaft to the Engine Vein. 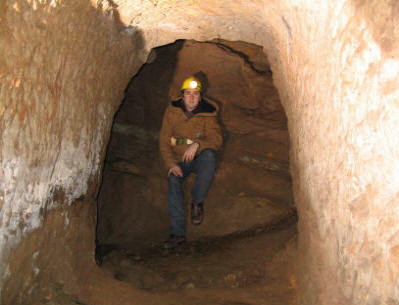 It is almost certain that the Roman miners had identified that the earlier men had been mining copper to a depth. The old workings would have been sloping and difficult to work so the Romans drove the shaft and level to undercut them and make working, and possibly drainage, much easier to manage.